The 2008-2009 theme was “Shoot for the Stars” and what a successful “Star Studded” anniversary year it was!! A new committee was formed that began to archive JLEP’s rich history of women building better communities over the last 75 years. JLEP celebrated the 75th as well as the 35th anniversary of “A Christmas Fair”. 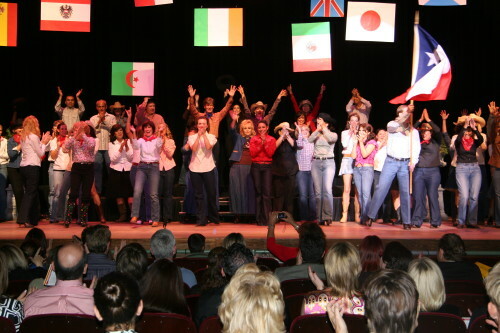 The special event honoring our anniversary year was celebrated with a revival of the Follies. “Deck the Halls with Stars and Follies” was performed at the historic Plaza Theatre. “Lights Camera A Christmas Fair” reported merchants and attendance in record numbers. Even with the economic down turn our fundraising efforts through “A Christmas Fair”, Grants, RDC, Cookbook and community partners surpassed the year’s projected budget. 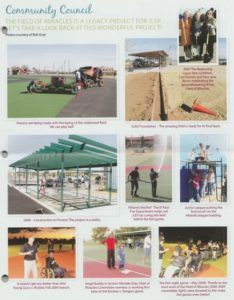 The Field will provide the opportunity for 18,900 children in the El Paso community with special needs the chance to play baseball, to make new friends and experience the thrill of being a member of a team! 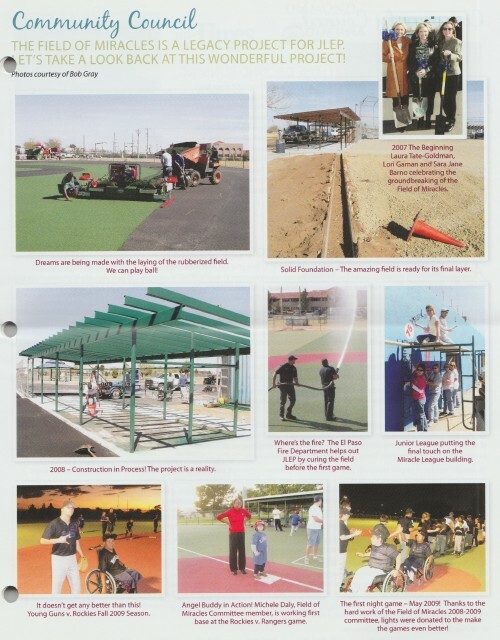 The Junior League of El Paso Inc. collaborated with the Miracle League Association to build a baseball field for the special needs children in the El Paso community. Junior League members will also serve as angels, buddies, to the special needs participants and will help to recruit community volunteers. The grand opening of was held on April 5, 2008. The Junior League provided $130,000 to support eight diverse community projects. Developing Dreams that exposed youth to new horizons through photography; El Paso Ambassadors that built community pride through guided tours of our city; Field of Miracles continued to bring joy to special needs children through an organized sport; Harvest of Hope increased public awareness of hunger and helped increase food supplies in our local area’s food banks with food drives and a 5k walk run; Women Empowering Women mentored women through leadership training and taught “dress for success” for low to moderate- income single mothers; Music Therapy of the Elderly enriched the lives of the elderly with vocal musical performances in area nursing homes; Kids in the Kitchen created a education program for elementary students to raise the awareness of childhood obesity and teach healthy nutrition, and provided funds for The El Paso Botanical Garden at Keystone Heritage Park with encourages environmental stewardship and provides a beautiful setting for events and visitors of all ages. Notable accomplishments include the hosting of AJLI West Texas Board and Ideas Exchange Conference; increasing the Endowment Fund to $131,000; producing a JLEP public awareness video and TV commercial; fashioning a new format for our Yucca and Yearbooks; implementing a new website database – Digital Cheetah – to streamline operations; beginning recycling programs at Headquarters; hosting a blood drive that donated over 50 units; producing Provisional’s 36 New Actives; hosting the “Starry Night Ball” honoring children with the “Make a Wish Foundation”; organizing a Heath Screening for membership; implementing new Bylaws and Policies to secure a stronger organization; recruiting 65 prospective Provisionals for the upcoming year; and researching eight new community projects for the next fiscal year!!! The League was proud to receive two consecutive Best of the Best Awards for the most outstanding non-profit organization in El Paso for 2008 and 2009. The prestigious Spirit of Amigo Award for 2008-2009, as well as the Presidents Award for Outstanding Leadership and Community Service, were presented to the Junior League of El Paso from the El Paso Convention and Visitors Bureau. Congratulations! !